The Finger Lakes are eleven glacially formed lakes in western New York, mainly linear in shape with a north-south orientation. They include Otisco Lake, Skaneateles Lake, Owasco Lake, Cayuga Lake, Seneca Lake, Keuka Lake, Canandaigua Lake, Honeoye Lake, Canadice Lake, Hemlock Lake and Conesus Lake. The longest, Cayuga Lake, is 40 miles from end to end, but never more than 3.5 miles wide and not atypical in shape, reminding early map-makers of the fingers of a hand. Considering their narrow width, both Cayuga and Seneca Lakes have a remarkable trait; they rival much larger Lake Ontario for depth, each more than 400 feet. The Finger Lakes region is an important agricultural region of New York. Cornell University, the state land grant institution is located on the southern end of Cayuga Lake in the town of Ithaca. The New York State Agricultural Experiment Station is located at the north end of Seneca Lake in the town of Geneva. The rolling hills between the lakes are occupied with many vineyards, wineries and dairy farms. Primary crops include cabbages, corn, hay, potatoes, wheat, oats, barley, soybeans, apples, grapes and some flowers. 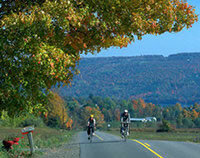 Today the Finger Lakes area is still known for fishing and hunting. Winter sports are also popular, with skiing, snowmobiling and ice fishing available. 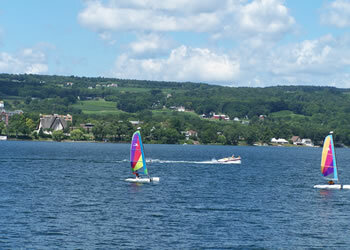 Located in the heart of central New York wine country, Keuka Lake lies 17 miles southwest of the City of Geneva. Keuka Lake is a unique member of the Finger Lakes because it's unique 'Y' shape instead of the other long and narrow shaped lakes. Because of its shape, it is often referred to as the Crooked Lake. Keuka lake ranks third in size among the Finger Lakes (behind Cayuga and Seneca Lakes). The hamlet of Branchport is located at the tip of the lake's northwest arm and the Village of Penn Yan tips the northeast arm. At the lake's south end is the Village of Hammondsport (the home of aviation pioneer Glenn Curtiss, the Father of Naval Aviation). Water Quality: very clear and well oxygenated at all depths. Keuka Lake serves as a public water supply for Hammondsport, Branchport, Penn Yan and Keuka College. Penn Yan is the village located at the northern end of Keuka Lake, the central lake of the Finger Lakes. The village has a total population of approximately 5,200 residents. It is the county seat of Yates County. The first frame dwelling in Penn Yan was built in 1799. The village became the county seat in 1823 and was incorporated in 1833. The first settlers were chiefly followers of Jemima Wilkinson (1753-1819), a religious enthusiast, born in Rhode Island. Wilkinson preached in Rhode Island, Connecticut, Massachusetts, and Pennsylvania. Obtaining a large tract (which was called Jerusalem in 1789) in the present Yates county, she founded in 1788 the village of Hopeton on the outlet of Keuka Lake about a mile from Seneca Lake. Many followers settled there, and she herself lived there after 1790. Some of her followers left her before 1800, and then the community gradually broke up. The name of the village is said to have been contrived from the first syllables of " Pennsylvania " and " Yankee," as most of the early settlers were Pennsylvanians and New Englanders. Many Amish and Mennonite families are recent arrivals to the area. Penn Yan is a healthy, vibrant community with a proud history.